I decided to list these mushrooms in with the edibles because they are ingested, albeit not in the traditional way of eating mushrooms. Lingzhi / linh chi / reishi mushrooms are medicinal mushrooms with a couple thousand year history of use and which have had many, many research studies over the years. 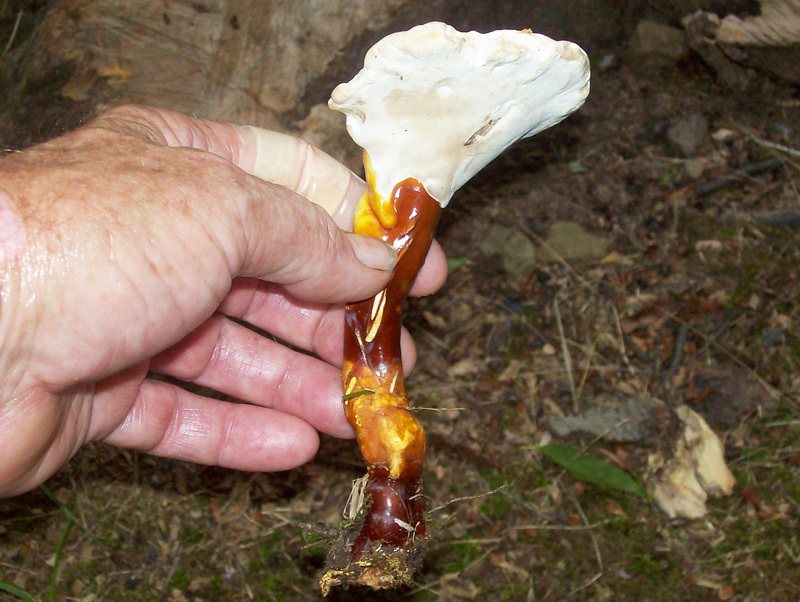 These medicinal mushrooms with the Lingzhi label are comprised of a few different Ganoderma mushrooms generally ageed to be G. lucidum, G. tsugae and G. curtisii. G. curtisii ( the cap is not full red but mostly ochre ) is a mostly southern U.S. mushroom. You can find it in Pennsylvania but not too often. Many of the medicinal claims for these mushrooms having health benefits have been verified. The U.S. Department of Health and Human Services has a medical research agency called the National Institutes of Health ( NIH ). Many people are aware of this research arm. What many don't know is that this agency has done extensive studies to determine what constituents are in various foodstuffs. Among the various foodstuff researched are mushrooms. With regard to these medicinal mushrooms there are extensive articles in their files about the benefits of, inter alia, the Ganoderma genus. 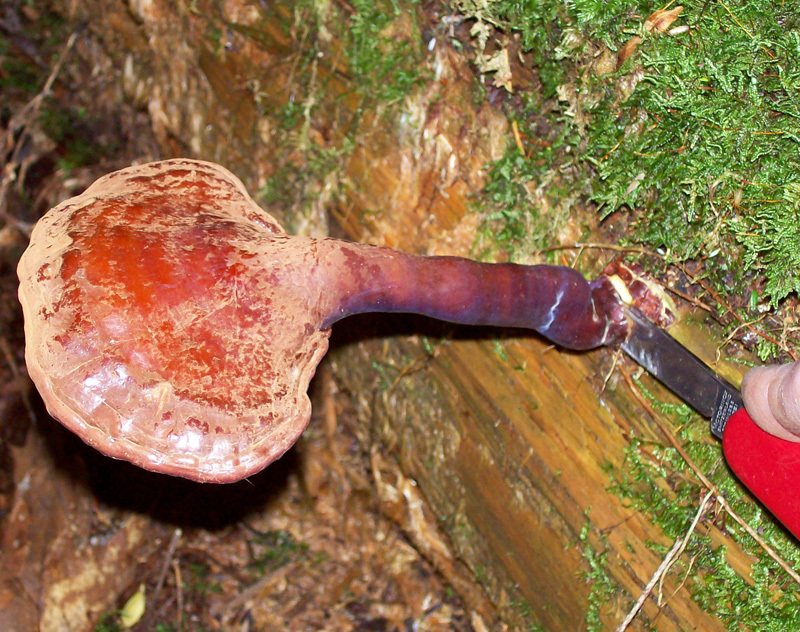 Ganoderma lucidum and G. tsugae are two closely related mushrooms that have virtually the same appearance. They are polypore mushrooms meaning that the undersurface has many pores from which spores are released. It is well agreed upon by mycologists that if the lingzhi mushroom is found growing on hardwood ( usually maple ) it is Ganoderma lucidum. 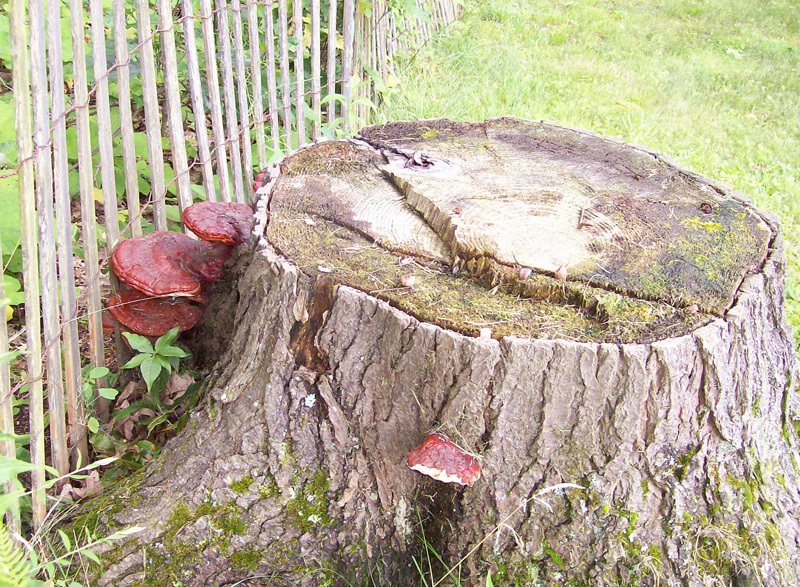 This maple stump will produce Ganoderma lucidum for several more years. And, if growing on conifers ( usually Eastern Hemlock ), then it is G. tsugae. G. tsugae also has a common name of Hemlock Varnish Shelf. Both look like someone applied red varnish on the upper surface. The pores are whitish and bruise brown. 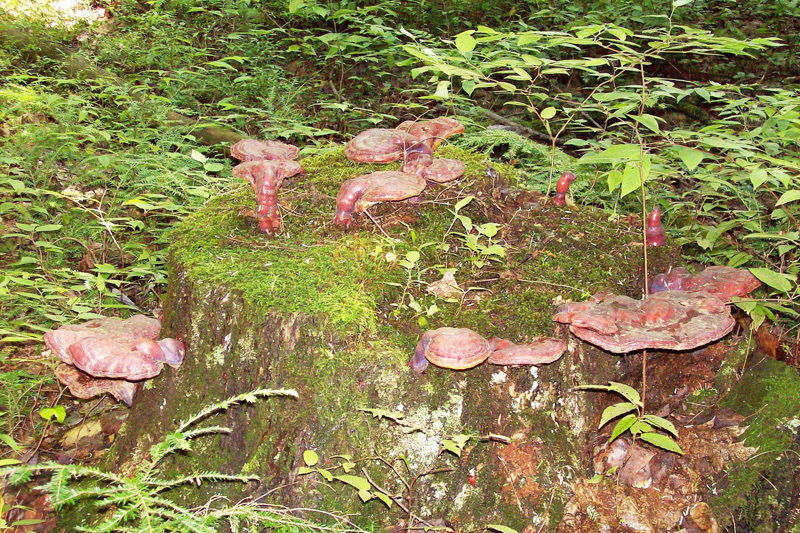 This hemlock stump has plenty of nutrients for several more decades of Ganoderma tsugae production each year. If you are going to search for G. lucidum in Pennsylvania be prepared to cover a lot of territory. You could literally check thousands of maple trees before running across one that has a growth on it. If you do find such a tree make sure you make note of it so you do not forget where these gems can be collected each year. Both G. lucidum and G. tsugae grow each year as a new mushrooms. They can be considered 'annuals'. Their cousin, G. applanatum ( Artist's Conk ), can be considered a 'perennial'. It gets bigger each year adding on a layer for each years growth. 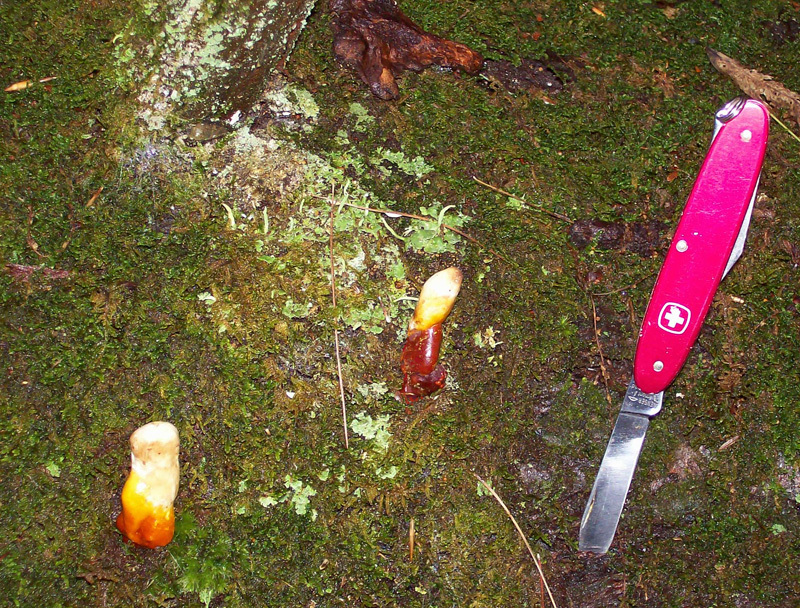 G. applanatum is also hard like wood contrary to the other two mushrooms which have a 'cork-like' consistency. Both of the Lingzhi types start out their lives as little buttons that elongate into what is referred to as antlers. These are probably G. lucidum antlers because the log appeared to me to be something other than coniferous, that is, the log did not have the characteristic branch remnants around the trunk at consistant intervals like hemlock or pine has. These antlers are on a hemlock stump. That makes them G. tsugae. Compare these with the colors of those in the prior photo. - with this G. tsugae's red cap. If you find enough good spots you could combine mushroom foraging with money making. Lingzhi of the G. lucidum, G. curtisii and G. tsugae varieties can sell for big $$$$. That's because there are millions of people on this globe sold on the health benefits. Go to eBay and do a 'Sold Listings" search for Ganoderma or lingzhi and be prepared for surprises. If you spend a lot of time in the woods like I do, hiking into new areas and observing the surroundings, you will probably stumble into some of these at some point. Since they grow each year and then wither away you will need to keep your eyes peeled from spring to summer. Imagine finding a few trees with several of these on each. You could buy a canoe or something. These mushrooms are consumed after they are sliced and diced, dried and then used as one would use tea. The heat at least helps break down the fungal cell's wall, which is composed of chitin ( all fungal cell walls are made of chitin ) which the human body's digestive system has a very difficult time breaking through ( that's why it is always best to cook your mushrooms ). ( Chitin is also what composes the exoskeleton of lobsters, crayfish, insects, etc. Without this cell wall breach the good medicinals within the lingzhi's cell can not be made available to the body. Imagine, if you can, swallowing a lobster - whole - without cooking it and without biting it. If you can't imagine a lobster try imagining such scenario with a small crayfish. However, the tea method requires long term usage since the beneficial ingredients of the mushroom are made minimally available to the body because tea, normally, is just not cooked long enough. However, using it as a medicinal extract is a different story. Making medicine is as easy as following an extraction process. - By soaking the slices or powder in grain alcohol ( often it's 100 proof vodka) for several days or weeks ( you will get the benefit of the triterpenes since they are alcohol soluble - but not the polysaccharides ). There is also another method where the results of the water simmering and the alcohol soaking liquids are combined. This is the 'Double extraction' method which is considered the superior liquid for using as medicine. A batch of powdered lingzhi is simmered in water for several hours ( low heat ) and then all the liquid is taken from the batch. Even the sludge is squeezed in a filter cloth to remove as much liquid as possible. The liquid is reserved until the next step is done. The squeezed sludge is put in another clean container to which grain alcohol is added. That container is then allowed to steep for several weeks, shaken or stirred up daily, and then that is decanted. The two liquids are then measured and combined so the new mixture has a 25% alcohol rating. That is what will preserve the liquid. ( which is really 50 % alcohol ) and add a skosh less than a pint of the decanted water from the first extraction step and mix the two. You will have 2 pints of medicinal liquid with a rating a skosh better than 25% alcohol. 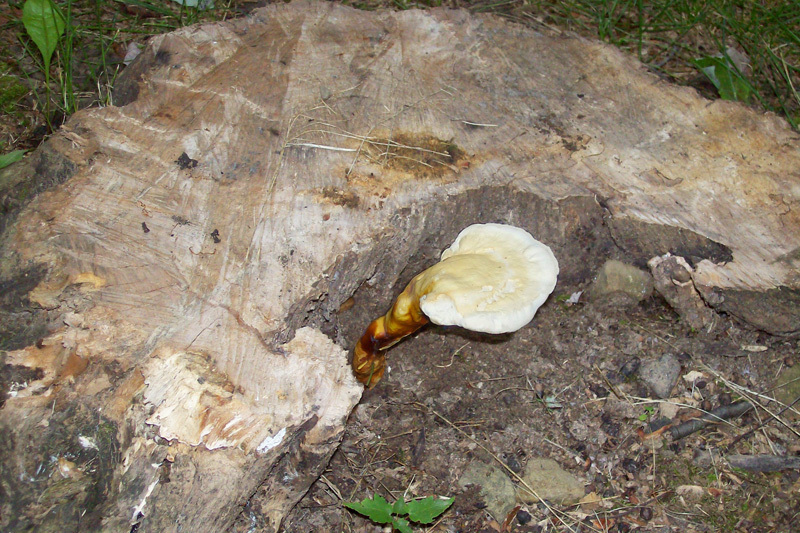 Ganoderma lucidum, G curtisii and G. tsugae. 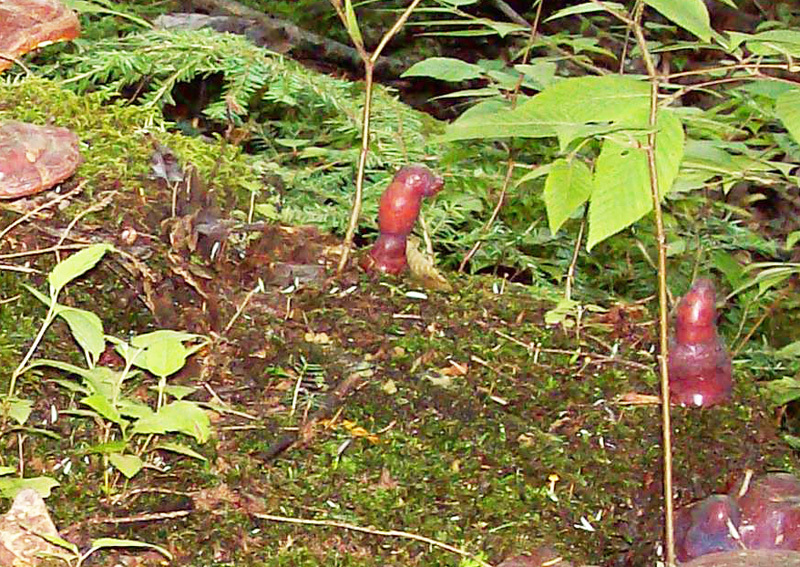 Two of the Ganoderma spp. mushrooms recognized as Ling Zhi. FOUND - In the Laurel mountains of western Westmoreland County and Somerset County. At the base of an old maple tree that had been blown over many years prior, a maple tree stump and on various old hemlock trunks and stumps.